Insulate pipes in your home’s crawl spaces and attic. These exposed pipes are most susceptible to freezing. Remember – the more insulation you use, the better protected your pipes will be. Heat tape or thermostatically-controlled heat cables can be used to wrap pipes. Closely follow all manufacturers’ installation and operation instructions. Seal leaks that allow cold air inside near where pipes are located. Look for air leaks around electrical wiring, dryer vents and pipes. Use caulk or insulation to keep the cold out and the heat in. 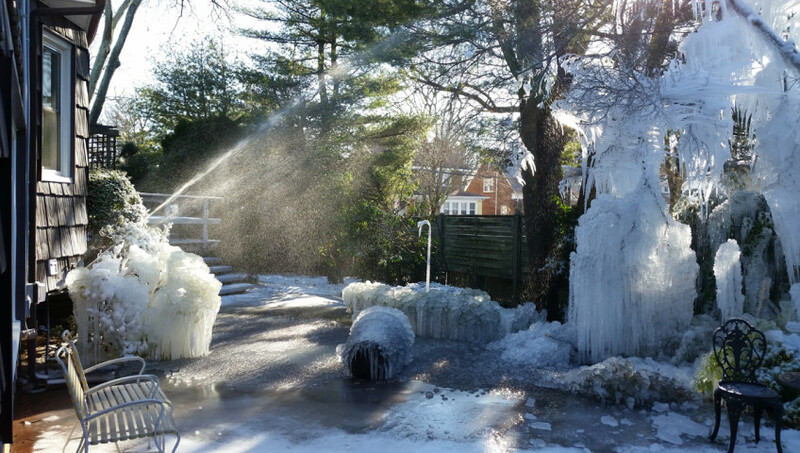 With severe cold, even a tiny opening can let in enough cold air to cause a pipe to freeze. Disconnect garden hoses and, if practical, use an indoor valve to shut off and drain water from pipes leading to outside faucets. This reduces the chance of freezing in the short span of pipe just inside the house. A trickle of hot and cold water might be all it takes to keep your pipes from freezing. Let warm water drip overnight, preferably from a faucet on an outside wall. Open cabinet doors to allow heat to get to un-insulated pipes under sinks and appliances near exterior walls. Set the thermostat in your house no lower than 55 F (12 C). Ask a friend or neighbor to check your house daily to make sure it’s warm enough to prevent freezing or Shut off and drain the water system. Be aware that if you have a fire protection sprinkler system in your house, it will be deactivated when you shut off the water. If you turn on your faucets and nothing comes out, leave the faucets turned on and call a plumber. If you detect that your water pipes have frozen and burst, turn off the water at the main shut-off valve in the house; leave the water faucets turned on. Make sure everyone in your family knows where the water shut-off valve is and how to open and close it. Never try to thaw a pipe with a torch or other open flame. You may be able to thaw a frozen pipe with the warm air from a hair dryer. Start by warming the pipe as close to the faucet as possible, working toward the coldest section of pipe. Do not use electrical appliances in areas of standing water because you could be electrocuted. G&M Construction Group of NY LLC provides commercial & residential home and building repairs throughout Nassau County, NY. Dedicated to a high level of customer satisfaction, we pride ourselves in repeat customers and referrals from our satisfied customers for new work. ©2016 G&M Construction Group LLC. All rights reserved.